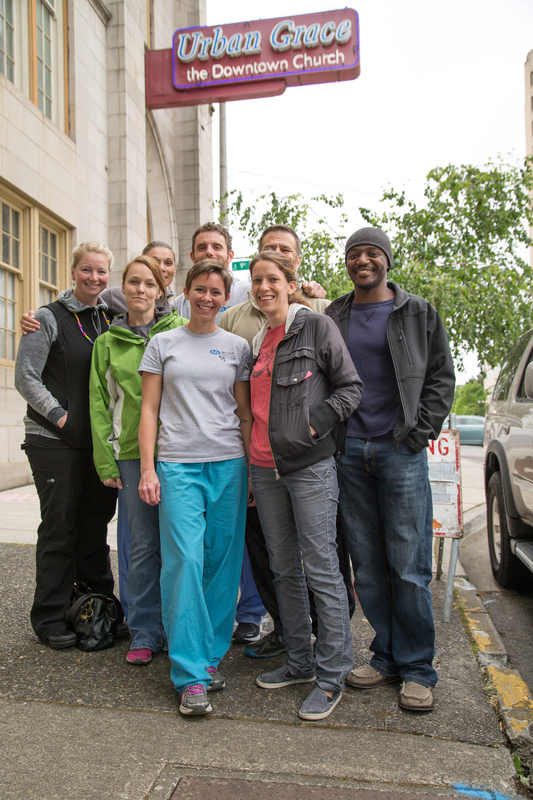 In 2014, members of the first class of physician assistant students at the newly opened MEDEX Tacoma training site considered taking on a community outreach project in addition to their classroom studies. 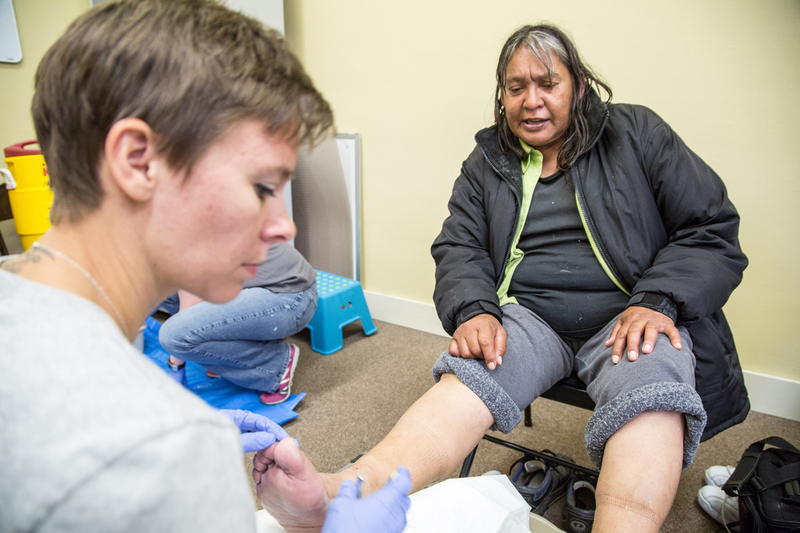 “It was important to us that we leave a mark,” says Kate Osborne, then a member of Tacoma Class 1 and co-founder of the Tacoma Foot Clinic. 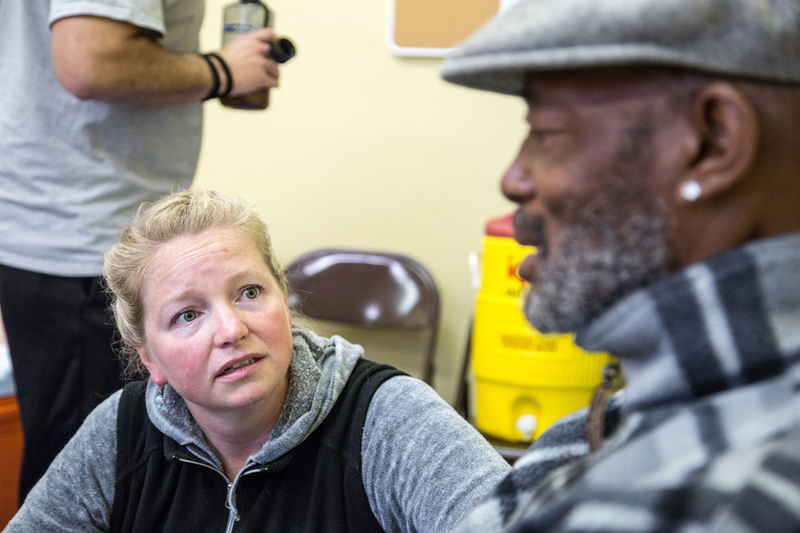 Kate and her cohorts had heard about the Sunday community breakfasts held at Urban Grace Church, a nondenominational ministry and the only remaining church in downtown Tacoma. “We came and observed the breakfast one morning, and got a sense that this is a place where we could really help,” Kate says. 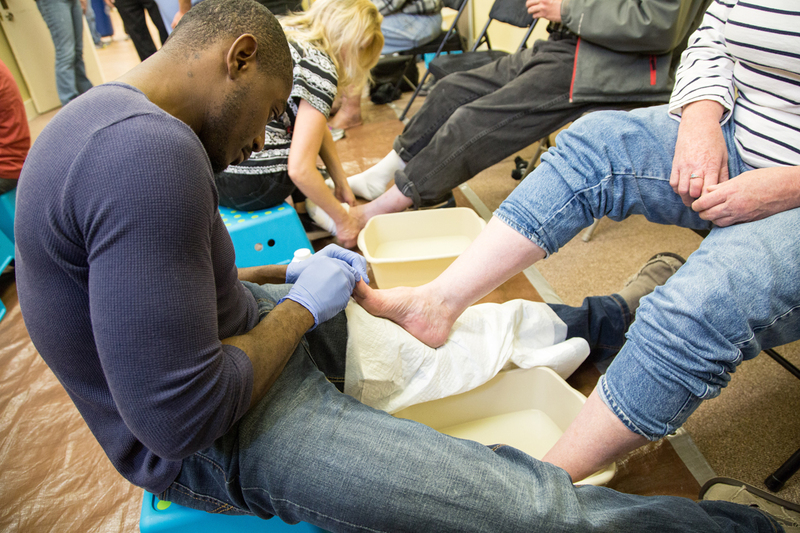 Each Sunday, around 300 free breakfasts are served at Urban Grace Church. 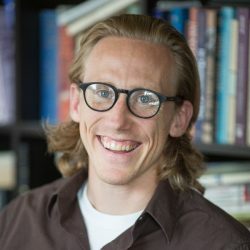 According to Pastor Ben Robinson, the folks who come through the community breakfast are evenly split between the actively homeless and those that are more food insecure. “Of course, the church is surrounded by a lot of subsidized housing,” Pastor Robinson adds. 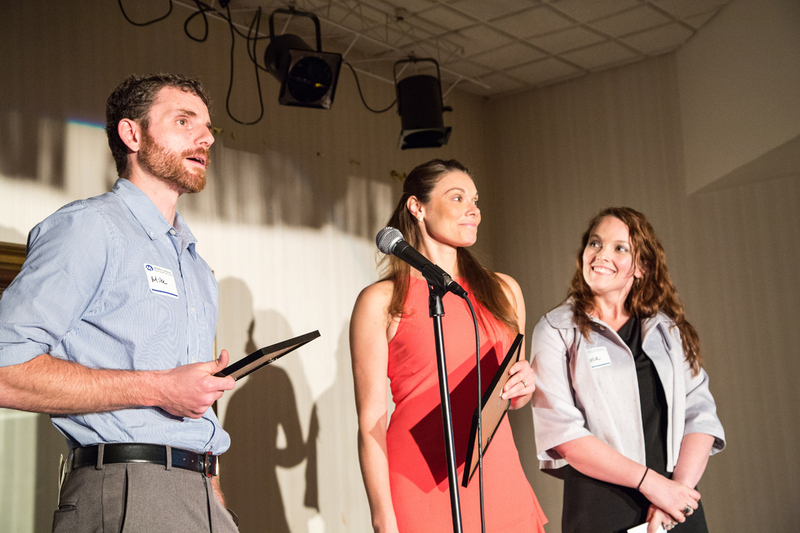 For Kate and her classmate, Mike Carter, the need was clear. At the community breakfast they encountered people who were on their feet all the time. “Depending on their situation these people could be walking between five and eight miles a day,” says Mike. The remedy seemed clear as well. 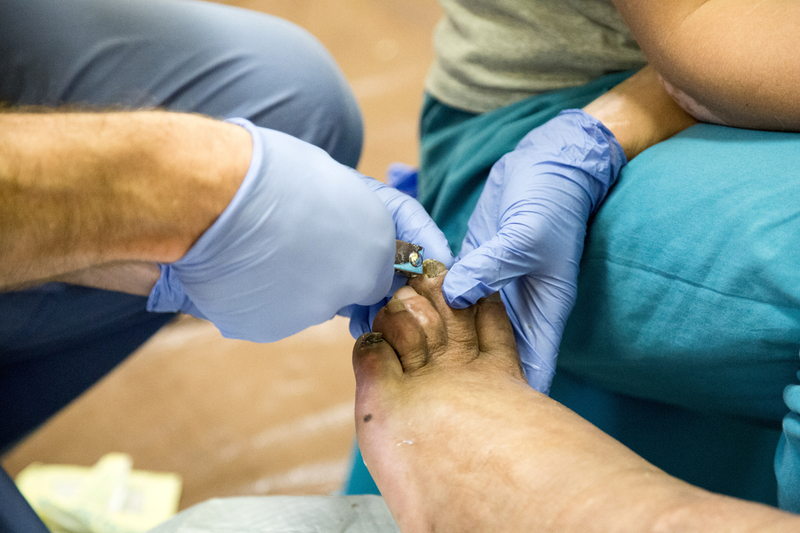 “We could help educate them in foot care, but also help them with their feet,” says Kate. 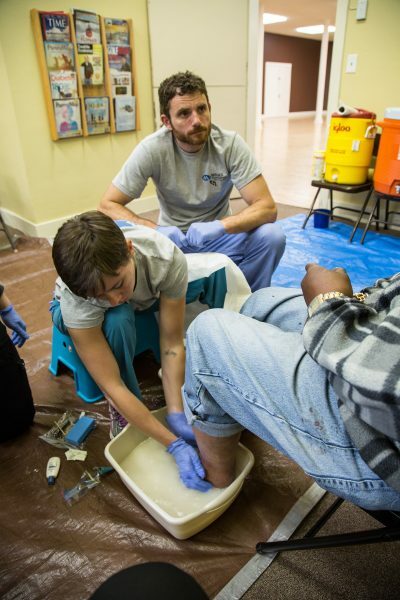 Now alumni of MEDEX Northwest and working in their profession, Kate Osborne and Mike Carter remain firmly attached to the Tacoma Foot Clinic, which is held on the second Sunday of each month at Urban Grace Church. 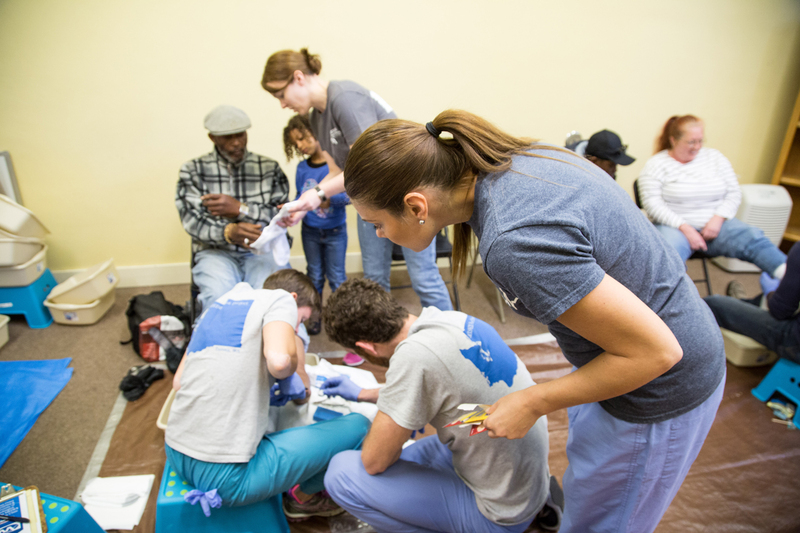 Along with current PA students from MEDEX Tacoma Class 3, they show up at 8 am to set up the makeshift clinic in a small room off the breakfast dining hall. 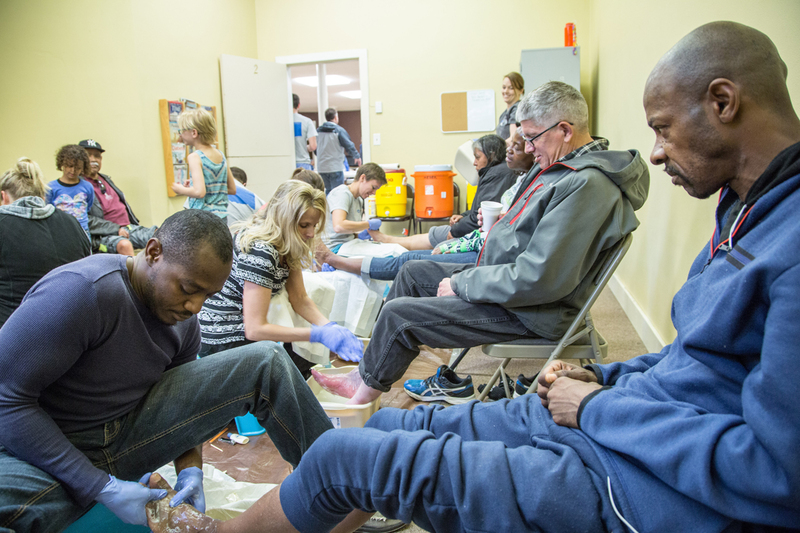 An announcement is made to the 300 or so people present, and interested individuals find their way into the clinic, where they are greeted and directed to a chair for something more than a pedicure. 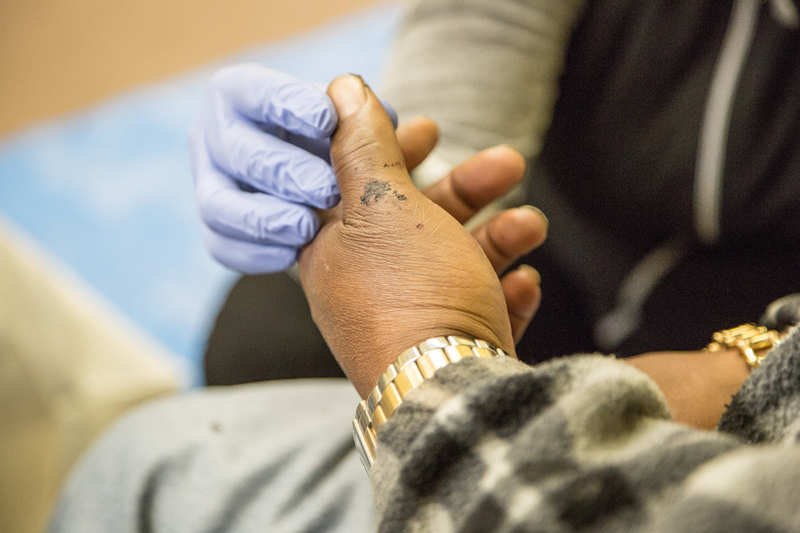 For the MEDEX volunteers, it’s an opportunity to connect with a population that’s often marginalized and pushed aside, to treat them with dignity and care. 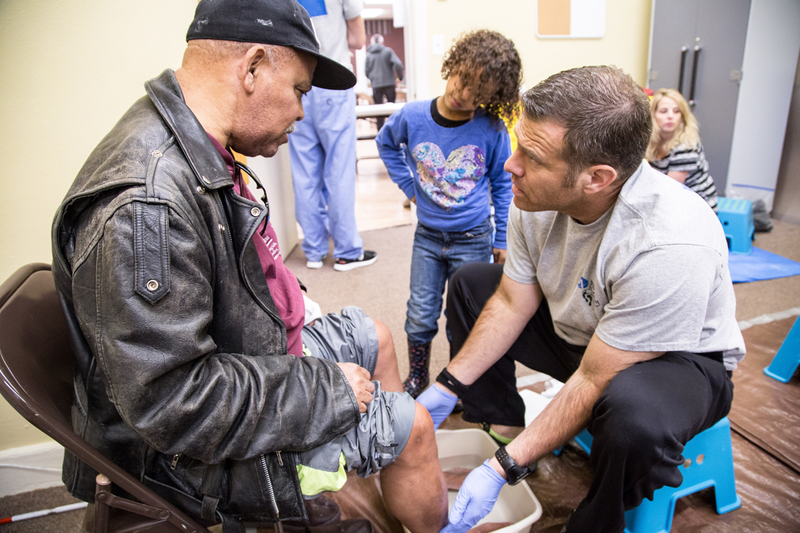 “As a pastor and leader of a faith community, I see this as so in line with the model of Jesus, who washed people’s feet,” says Pastor Robinson. 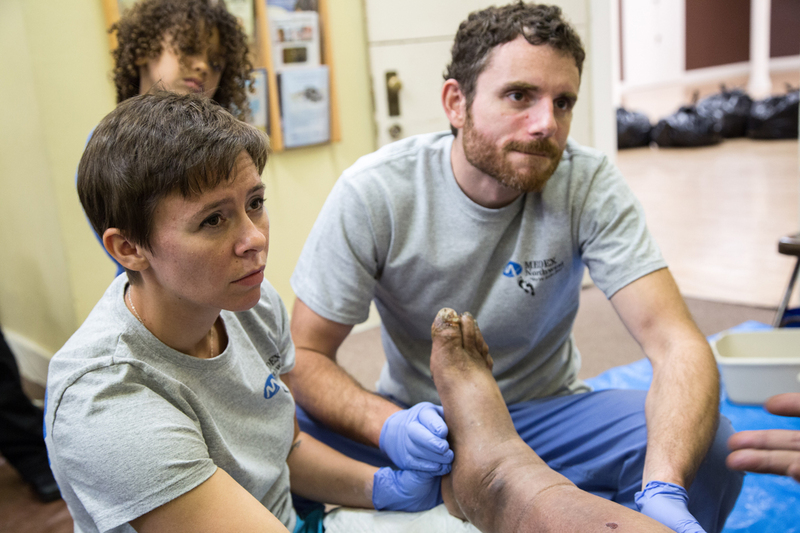 Missy Griffith and Mike Carter, PA-C, work with a 60-year-old man presenting with severe bilateral lower extremity edema. The client is 63 years old and on the streets. 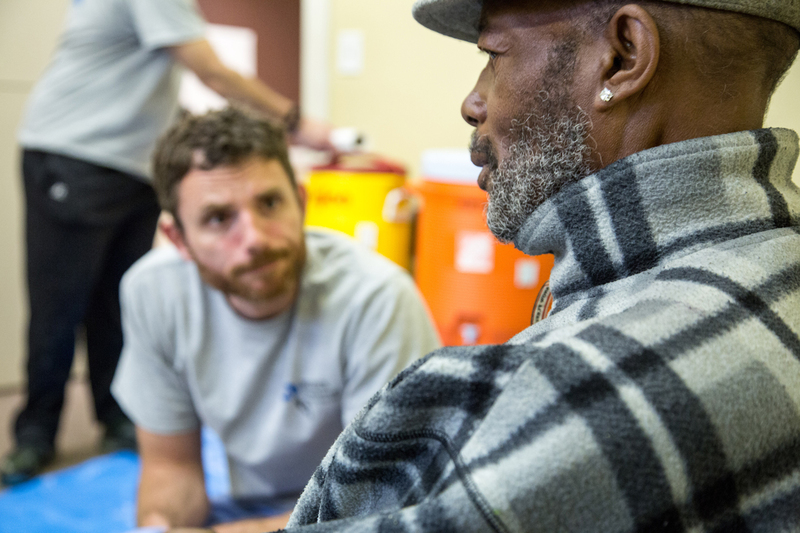 After spending time with him, Mike has little faith in the client’s ability to follow through and get the care he needs. “Absolutely terrible,” he says. Never short on vision, Vanessa spells out exactly what they need to be able to expand their reach. 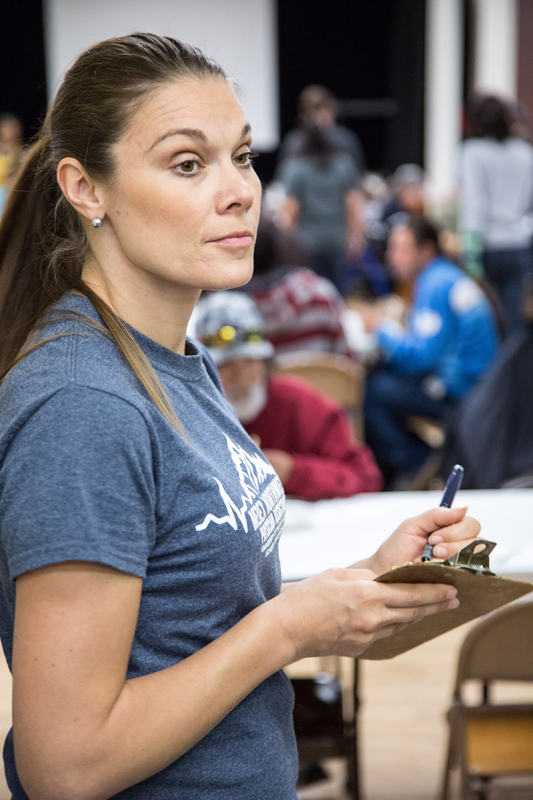 Kate Osborne, PA-C, checks in foot clinic clients as they arrive. “Money,” she says. “And we need space. Urban Grace is a wonderful setting where they have provided us room to do our work for free. 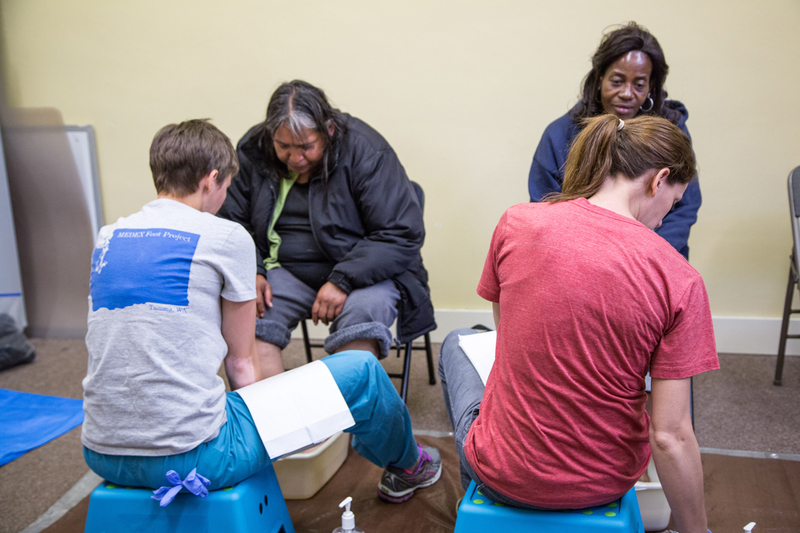 But if we were to expand and provide true medical care, we would need true clinical space with running water and exam rooms.” In the current quarters at Urban Grace, the MEDEX volunteers must lug water in 10-gallon jugs back and forth from the kitchen to provide warm water for the foot care. 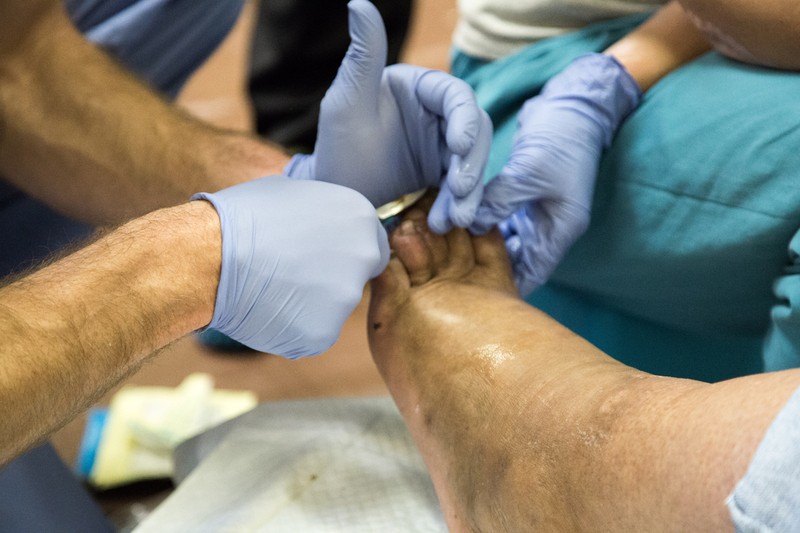 For current MEDEX didactic students, participation in the foot clinic offers a much-needed relief from the classroom and a reminder of what they’re working towards. Prior to PA school, Missy Griffith was a paramedic for 10 years in Bremerton. Now she is a member of MEDEX Tacoma Class 3, and has taken on a leadership role with the clinic for her class, a mantle that will be passed on to a member of class 4, as Missy enters her clinical year. In April both Mike Carter and Kate Osborne were presented with the 2016 MEDEX Humanitarian Award at the annual MEDEX Reception for their work with the foot clinic. Vanessa Bester looks on at the right. 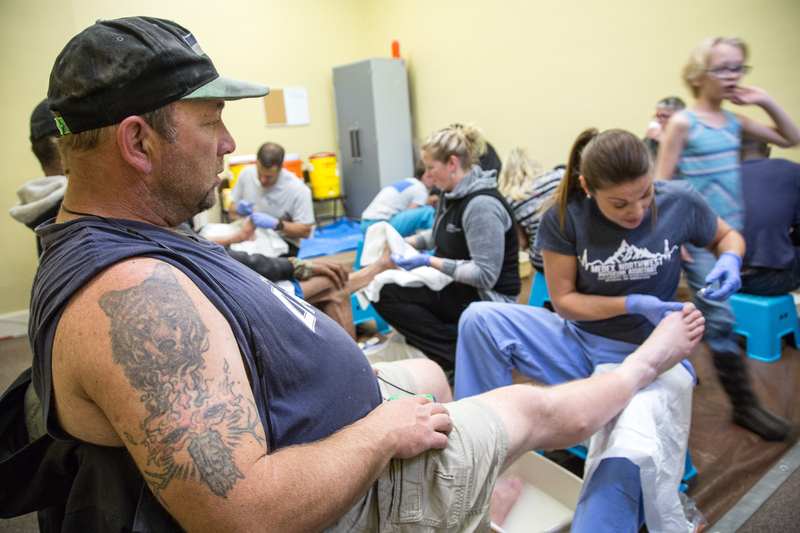 In lieu of expanded clinical services, there are things needed to keep the Tacoma Foot Clinic afloat. Chief among them are material supplies: packages of men’s white classic crew socks, Lysol wipes, travel size lotion, pumice stone, emery boards, oatmeal bath single packets, travel size soap, toe nail clippers, garbage bags and Ziploc bags. 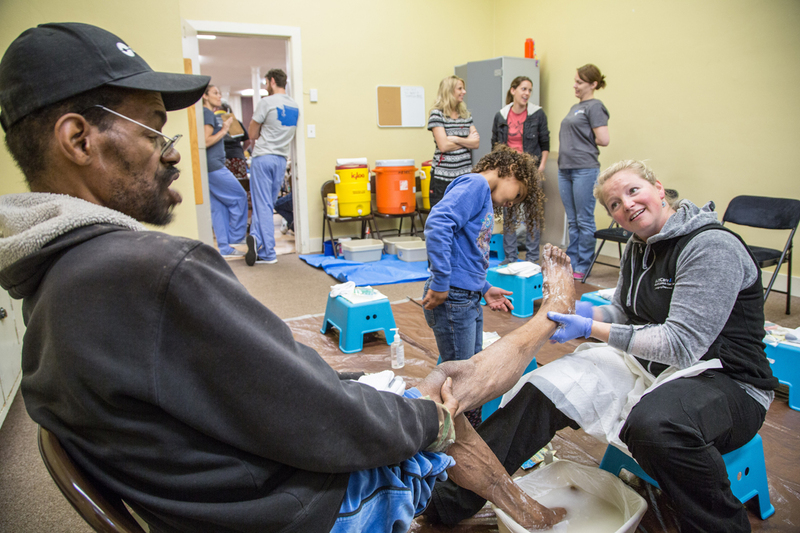 Foot clinic volunteers on Mother’s Day, left to right: Amanda Brown, Vanessa Bester, PA-C, Kate Osborne, PA-C, Mike Carter, PA-C, Missy Griffith, Aimee Edmunds, Doug Aguirre and Frantz Alphonse. 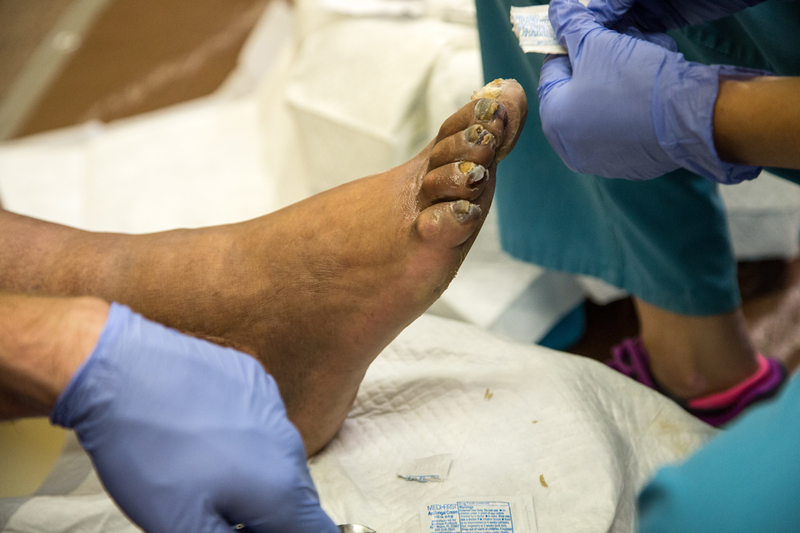 The MEDEX Tacoma Foot Care Clinic takes place the second Sunday of each month from 8:30 to 10:00 am at Urban Grace Church, 902 Market St, Tacoma, WA 98402. 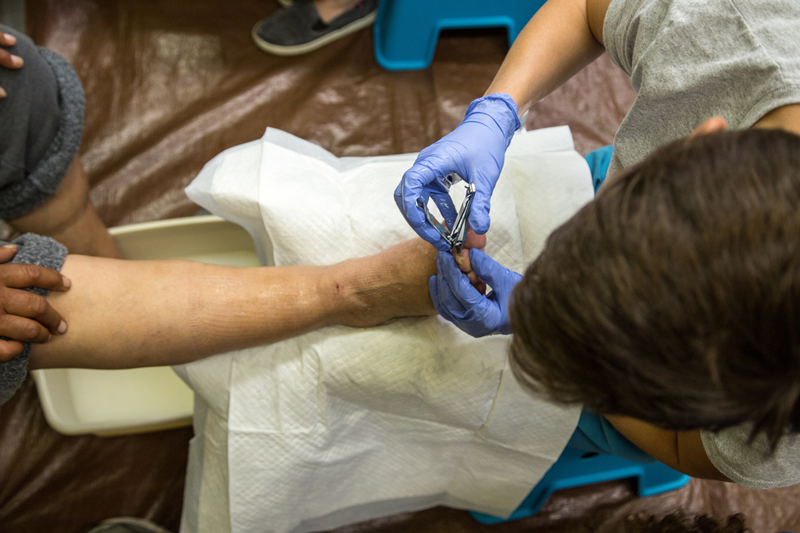 For more information, to give your time, materials supplies or money write medxfoot@uw.edu. Dennis Raymond is the Communications Manager for MEDEX Northwest in Seattle, Washington. He can be reached at medexcom@uw.edu.